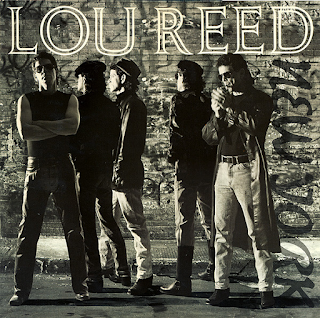 After a career so intertwined with New York City, quintessential wry New Yorker Lou Reed finally put out an album dedicated to the city. It was a wonderful album, possibly the best of his solo career, and yes, that includes the ever-so slightly overrated "Transformer". It is full of muscular guitar riffs, strong, confident vocals and an ear, as always, for a killer melody. All manner of subjects are covered - ecology, the environment, corrupt politicians, AIDS, parenthood, urban street life, abusive relationships and many more. It was as if after years in the comparative wilderness, Reed had undergone a renaissance. 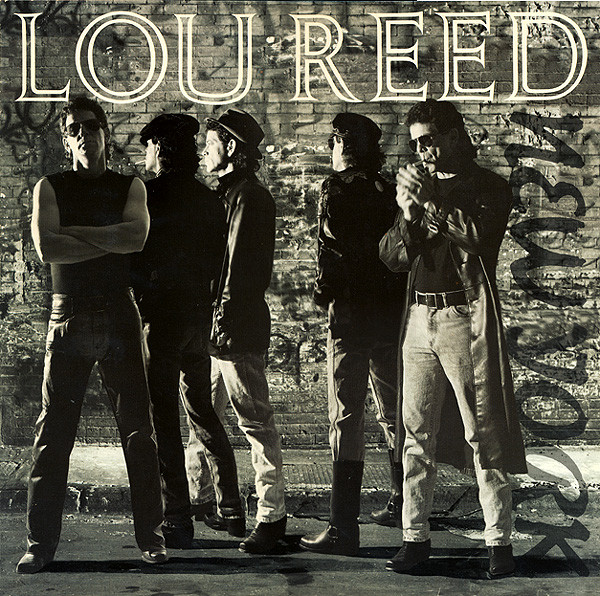 Personally, I hadn't bought a Lou Reed album since "Berlin", but I bought this, and loved it. It was a solid, powerful rock album dealing with serious matters. Remember this was 1989, this was no throwaway vacuous pop album, and, thankfully, there was no synthesiser to be heard. 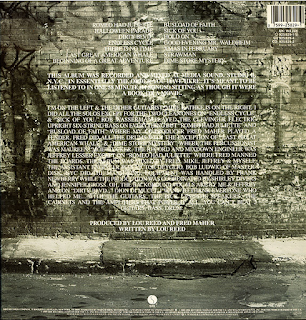 Things started to change with the release of this album. "Romeo Had Juliette" begins with a powerful electric riff before Lou's instantly recognisable voice arrives to remind just how strangely suited to rock was his semi-spoken, expressive vocal. The song is full of Springsteen-esque street imagery. It gets the album off to a seriously great start. "Halloween Parade" is a heartbreaking, mournful and tender song about those los to the AIDS epidemic. Characters like those in "Walk On The Wild Side" are those mentioned, but they are now gone, as Reed sings, their voices never to be heard again. Reed is now sad and reflective and the awful reality of it all. "Dirty Blvd." continues the street scene thing begun on "Romeo Had Juliette" in another captivating guitar-driven number. A huge Stonesy riff accompanies he chorus and Reed's cynical lyrics are a glory to behold. "Endless Cycle" has a fetching melody, but it tells a dreadful tale of child abuse. As on his 1973 "Berlin" album, Reed manages to cover awful subject matter very convincingly. Beneath the despair, the song has an infectious feel to it. "This Is No Time" is a thumping, protest song against corrupt politicians, destructive patriotism and "phoney rhetoric". "Last Great American Whale" uses an ecological metaphor to express Reed's woe at the loss of the American deal, or any sort of morality. It is sung starkly against a moving solo electric guitar backing. "Americans don't care much for anything, land and water the least...". It sort of says it all. "Beginning Of A Great Adventure" is a jaunty, but low-key little song about possible parenthood, in the lyrical style of David Bowie's "Kooks", to a certain extent. Far more cynical, of course. "Busload Of Faith" has the riffs returning for a punchy, upbeat number that once again tells us just what we need to get by in this miserable old world. There is hope in Reed's outlook, but only just, we need a busload of faith. "Sick Of You" has the same carefree-ish sound of "Beginning Of A Great Adventure" with some brilliant rapped-out lyrics on all sorts of contemporary politics and politicians that Reed is sick of. It sort of spews out like Dylan's "Subterranean Homesick Blues". There is some great additional guitar in the middle passage too. "Hold On" has Reed laughing demonically over a chunky guitar opening and he begins a melodic rant about "the statue of bigotry.." amongst many other things. Again, it is full of great lyrics - it just keeps on giving. So much of it is so relevant today, too, sadly. On "Good Evening Mr.Waldheim" Reed raps his invective out over another riffy backing against Austrian politician and ex-Nazi Kurt Waldheim but also against The Pope and civil rights activist Jesse Jackson. I'm not quite sure why Jackson has got Reed's goat, something about hypocrisy, I believe. Basically, old Lou is fed up with the whole damn lot of them. I know how he feels. "Xmas In February" is a bleak, vocal and guitar song denouncing the Vietnam War and the plight of the veterans. My own favourite on the album is the barnstorming, fist-pumping "Strawman", with its mighty guitar sound and spat-out invective against politicians. "Does anyone really need a billion dollar rocket?..". No. The album ends with the evocative, beguiling "Dime Store Mystery". It has Lou going all religious, as he always did occasionally. It features some killer guitar in the middle. 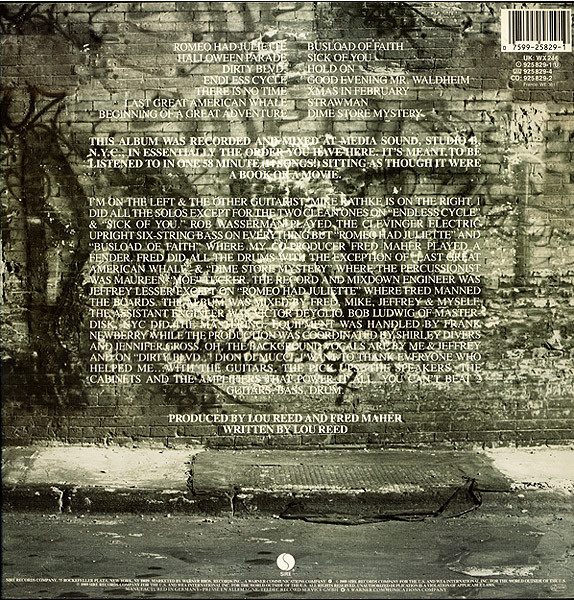 Lyrically, it ends an album of questioning and righteous anger with a bit of pious reflection. Overall, this was a mighty album, one of the best of its time. Highly recommended.